These questions, and questions like these, have important implications for global financial markets, monetary policy and the economic outlook. Based on a textual analysis of FOMC minutes, our answer to both is “yes”. 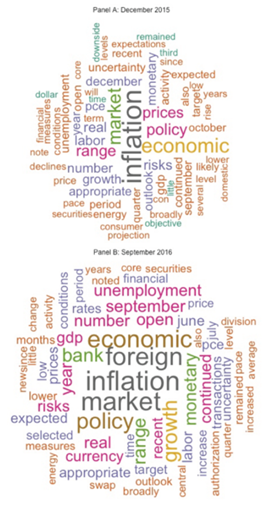 We compile a list of words in recent FOMC minutes to create a set of word-clouds where the frequency of words within each panel is represented by their relative size and colour. Some constellation of words has remained constant throughout the year. Unsurprisingly, FOMC communications always feature prominent discussions on the topics of “inflation”, “prices”, “gdp”, “growth”, and “labor”. (Panels A and B). But there was a striking increase in focus on risks at the January meeting, during a period of global financial market volatility. The topics introduced in January continue to play a significant role in more recent discussions, as seen by the prominence of “foreign”, “market”, and “risks” in the September minutes (Panel B). Domestic data outturns will continue to guide the FOMC’s monetary policy stance. However, since the start of this year, the committee has given a greater prominence in its communications of foreign and financial market risks to the domestic economic outlook. Of course, this rudimentary analysis cannot fully explain the subtle and changing nature of setting monetary policy. Nevertheless, we find it an instructive, and visually appealing, way to digest FOMC communications! Dan Wales and Emil Iordanov work in the Bank’s International Surveillance Division. Previous Post Macroprudential Regulation: Two birds with one stone?